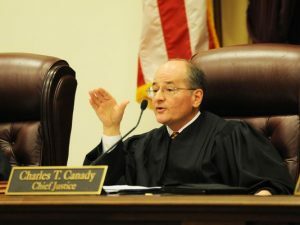 The Florida Supreme Court announced recently that Justice Charles T. Canady of Lakeland, Florida, will serve as the Court’s next Chief Justice. In March, the seven-member Court elected Justice Canady to serve a two-year term as Chief Justice, beginning July 1, 2018. He succeeds Chief Justice Jorge Labarga, who will remain on the Court as a Justice. This is Justice Canady’s second term as Chief Justice. Justice Canady previously served as Chief Justice of the Court from 2010 to 2012 and is the first Justice to serve two nonconsecutive terms as Chief since 1973. He was appointed to the Court in 2008. In the years preceding his appointment, Justice Canady served as a judge on Florida’s Second District Court of Appeal, as general counsel to Governor Jeb Bush, and as an elected member of both the U.S. and Florida State Legislatures. Jay Yagoda is an attorney in Miami, where he handles commercial disputes from the onset of litigation to appeal.